GreaseBuster Solutions LLC has the perfect product line for reducing your cooking oil costs and disposing of your used cooking oil in a safe and sanitary manner. Our GreaseBuster product line is manufactured in the USA and has been in production since 2001. We are dedicated to increasing the profit margins of your commercial kitchen by providing safe and efficient methods of managing the disposal and filtration of your cooking oil. A portable, self-contained hot cooking oil extraction machine designed for one person to safely and quickly extract used hot cooking oil from all sizes of fryolators for temporary storage. 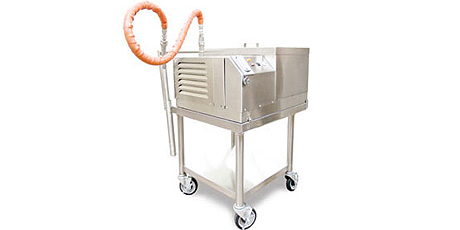 A mobile filtration unit intended for daily use that quickly filters dirty fryer oil in three phases to extend the oil life cycle by 30% to 50%. Managing the life cycle of cooking oil from filtration to extraction & storage. 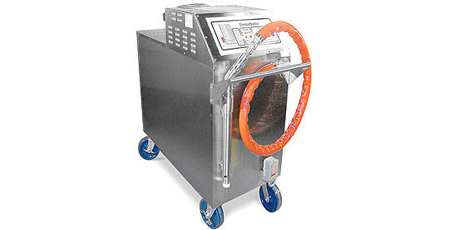 GreaseBuster Solutions is a company dedicated to providing more efficient and safer methods of managing your hot cooking oil in commercial fryers. GreaseBuster Solutions is privately held and growing! Contact us directly to inquire how you could grow with us in an excellent investment opportunity. "The benefits of the GreaseBuster are tremendous: no more unsightly and odor ridden grease barrels at our facility, no more accidental grease spills, a major reduction in pest attraction, labor savings, increased employee satisfaction, reduced chance of employee injury and reduction in down time when grease is changed in fryers..."
"Because of our GreaseBuster, life for our kitchen employees has become easier and safer. We no longer have to carry pots (of grease), we just roll the GreaseBuster and we don't worry about accidentally spilling or getting hot grease on our employees. Thank you for such a wonderful product and I would strongly recommend it to anyone." "The GreaseBuster is very user friendly and safe. Our chefs love it! It now takes one-third of the time to drain and clean the fryers. The chefs don't have to go outside at night to dump the grease anymore which is another safety/security issue every restaurant deals with.The outside area of the restaurant stays cleaner because we're not carrying out hot grease to dump..."
GreaseBuster Solutions is a privately-held family-owned business in operation since 2001. We are dedicated to providing more efficient and safer methods of managing used hot cooking oil for commercial fryers. Accept no imitation! © Copyright Grease Busters Solutions. All Rights Reserved.